With this case study we are going to look a little bit more in-depth at how lime based mortars are applied to walls on older buildings. 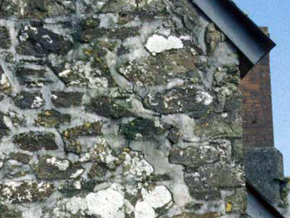 The example we are using features a chimney and a gable end wall on a 17th Century farmhouse that had inappropriate cement pointing applied to the stonework. 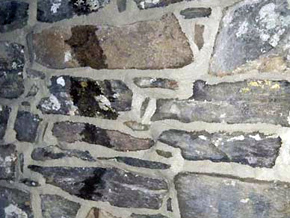 By using images to highlight the steps taken we hope that you can also see the benefits of using traditional mortar mixes on such buildings. 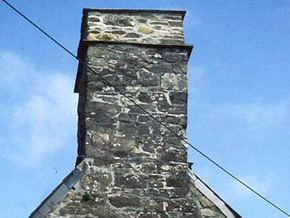 Firstly, if you take a look at the image to the left this is the chimney that we are going to examine. At first glance it doesnt appear as if there are any major issues, but when you get close up you start to see evidence of cracks between the hard and dense cement pointing and stone joints which allows moisture penetration by capillary action resulting in damp and associated defects. The water has literally washed through the wall core removing the fines from the bedding mortar. The first of the two pictures below highlights this in more detail. 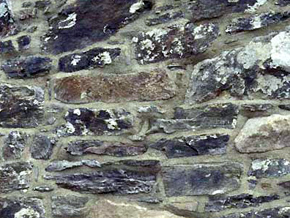 Note the gaps and cracks appearing due to the use of unsuitable mortar in the wall. 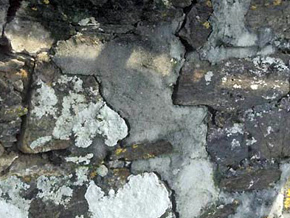 The second picture illustrates the size of the void left after the cement based pointing is removed. Voids of this size potentially lead to larger problems with damp. These voids need to be filled with a lime based grout. 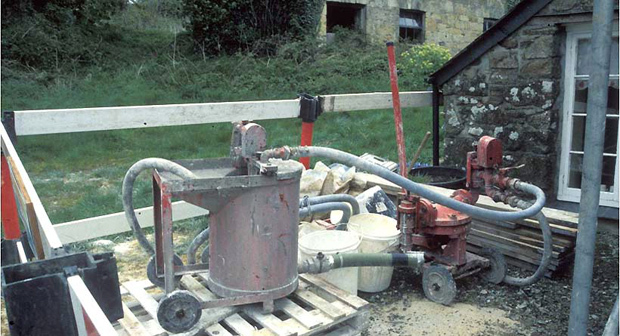 Our next picture featured below shows how grouting is injected using a hand operated diaphragm grout pump. The pump has a gauge to ensure the grouting pressure is carefully monitored. On weak masonry such as this, grouting can be safely undertaken up to 5 psi. 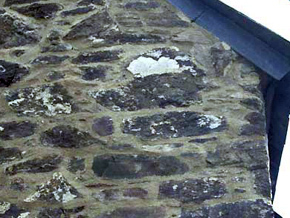 The next two pictures below show firstly the new lime mortar shortly after it is applied. 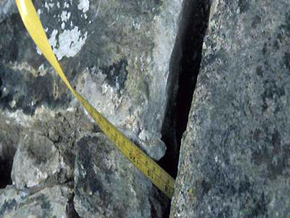 The second picture shows how the mortar mix looks after it has been tamped with a churn brush in order to push the mortar back beyond the ariss of the stone. And finally we said at the start that this is a before and after scenario, so here is a before and after pic to round off this case study.